We are a melting pot of college students, young professionals, minamalists, entrepenuers, law officers, teachers, gymnasts, martial artists, tree-huggers, skate boarders, musicians, and people of many other backgrounds and cultures all driven and inspired by the same thing, the art of motion commonly known as parkour and/or free-running. Being such a large group with this shared interest we often find ourselves working together outdoors to master our skills and techniques within the art of movement, and often have a great time doing so, such a great time in fact, that we have become a community devoted to introducing all interested parties to this incredible art through outdoor workshops and events, as well as indoor classes for those who are interested but nervous to start outside right away. Heres a better question, why not? It’s fun, it’s an amazing workout, it’s a positive outlet that can calm the mind, and reduce stress levels in a heartbeat (no pun intended). At first glance, many people say that we are foolish, crazy, reckless, or putting our lives in danger, but the truth of the matter is that we are just misunderstood. We didn’t just wake up one day and decide to jump on a rail, or launch ourselves at a wall! 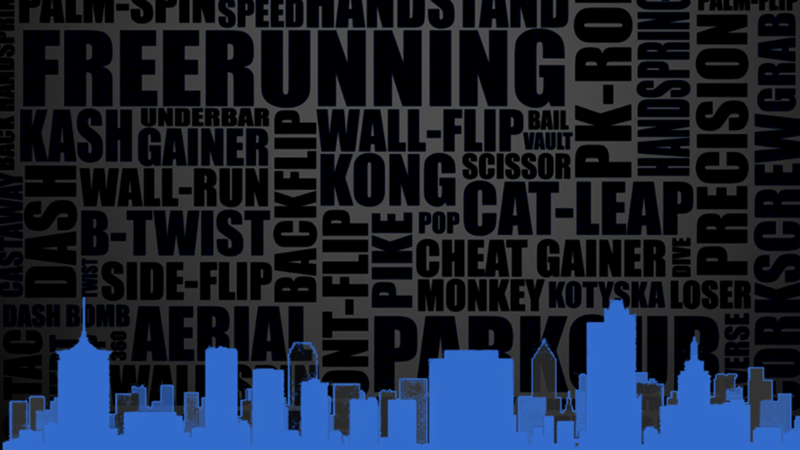 We were inspired by the thought of freerunning, and conciously decided we’d do it. We worked up to the things we do much like a discipline in the martial arts, and as we did so we began to discover just what the human body is capable of with the right skill set, mindset and outlook.